Home / Blog / Competitions & Giveaways / Bucketlist Camino competition! To help you tick the Camino off your bucketlist for 2016 CaminoWays.com have teamed up with clothing specialists Portwest and Hi-tec to offer you some amazing prizes. In our bucketlist camino competition you will have the chance to win a trip of a lifetime for you and a friend on the Camino de Santiago as well as some stylish outdoor clothing for the journey. The Camino de Santiago is an ancient path and unique journey. Pilgrims from all over the world have followed the many paths to Santiago de Compostela and the tomb of St James for centuries. Today, whether walking the Camino for religious or spiritual reasons, to finding yourself or for its natural beauty, the Camino de Santiago is a unique experience that inspires many, even after their journey is over. 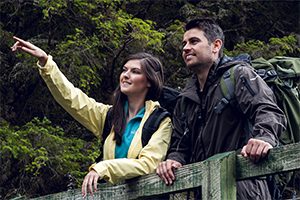 You will get kitted out in all of the best outdoor gear, suitable for the very best walking holidays. 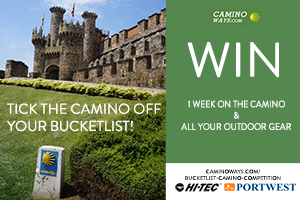 We are excited to give you the opportunity to win one week on one of the famous Camino trails, plus two pairs of Hi-tec walking boots, two Portwest fleeces and two foldable rain jackets. What the prize includes: B&B accommodation, luggage transfers and holiday packs for winners. Clothing to be shipped/posted to winners! This competition is now closed. We will announce the winners on April 3rd. Good luck everyone! Prize is valid to travel with CaminoWays.com until March 2017 on one section of the Camino for 6 nights/7 days. Travel dates depend on hotel availability, we recommend the winner contacts the CaminoWays.com team at info@caminoways.com as soon as possible to confirm the booking. Prize is not transferable and can’t be exchanged for cash. Winner will be announced by CaminoWays and Portwest. Prize includes B&B (bed and breakfast), luggage transfer from hotel to hotel, holiday pack with practical information. Not included: flights, transport, insurance, dinner/lunch. Hi Connie, you can see the winners for the bucketlist competition here: http://caminoways.com/bucketlist-competition-winners. We’ll be announcing the winners for the Summer Camino today. Who won? I have not seen a list yet. Fingers are double crossed! How I wish i were based in the UK!!! This prize would make suuuuuuuuuuch a huge difference to me. Good luck to the entrants! It would be lovely to win this competition. I would bring my friend debs. She has supported me through so many things In my life.